Pressure differences between rooms in hospitals, laboratories and other demanding environments can be controlled through pressurisation and depressurisation to ensure favourable working conditions and the cleanliness of products. Designed to monitor pressure differences between rooms, differential pressure transmitters measure the difference in pressure between the cleanroom and the outdoor air. DPT250-R8-AZ-D-S, which measures even the smallest pressure differences, is an excellent choice when the pressurisation of facilities requires high precision and operational reliability. In addition to measuring pressure differences, it is important to measure the temperature and humidity in cleanrooms. The RHT humidity and temperature transmitter is the perfect choice for such measurements. All our Cleanroom devices include field calibration and are available with the calibration certificate. Our devices ensure uninterrupted production in cleanrooms, which require reliable, continuous monitoring. The DPT250-R8-AZ-D-S (1) high-precision differential pressure transmitter monitors overpressure in laboratory facilities. The DPI digital differential pressure switch (2) activates the beacon alarm light with a relay output if the pressure in the facility exceeds the threshold value. 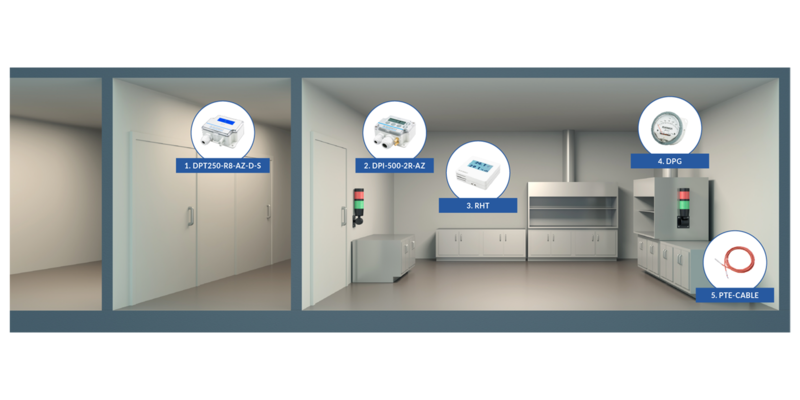 RHT (3) communicates the room temperature and humidity to the automation system. The DPG analogue gauge (4) is easy to read, which makes it suitable for indicating the exact pressure in the laminar flow cabinet. PTE-Cable (5) measures the temperature in a refrigerated cabinet, making it possible to collect historical data over the long term.